But no matter the reason your workers' compensation claim is denied, we are here to help. We will follow through with your work injury claim and fight for the money that you deserve. 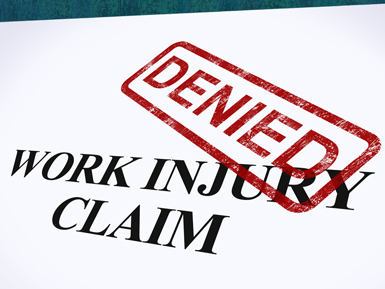 However, your workers compensation claim being denied does not mean that you do not have a compelling case. Gilbert, Blaszcyk & Milburn, LLP will work diligently with you and pair you up with an expert workers compensation lawyer who will strive to get the proper compensation for your injury. We are here to listen to your case and help plan your legal actions in order to provide you with the best case possible. We have the experience required to handle workers comp cases of all sorts. Most businesses give denied employees the option to appeal their decision. Contacting your insurer to inquire why your benefits were denied is the first step you should take in this process. Your insurer can tell you in detail why your claim fell through. From that point, you and your workers comp denial lawyer can decide if the appeal is worth pursuing or if you need more information. Through our years of experience in the field, we have become a name you can trust. Your lawyer can also review your injury's medical documentation with your health provider. Together, they can determine if a more detailed or specific medical report should be submitted to the judge during your appeal trial. Deciding if there is sufficient evidence of your injury is another way your lawyer and health provider can help your workers compensation case. For these reasons, it is important to document being injured on the job, thus providing a more clear picture of your case. And be thorough. Do not leave out any details. You never know what aspect, big or small, could help you win your case. Before you begin your process for an appeal trial, having the proper documentation to show the judge is vital. This means you must trust your workers comp denial lawyer in order to receive the benefits you deserve. Our firm has the tools necessary to help you, step-by-step, through this process. The team of lawyers are all well-versed in the procedural process of a workers compensation case. We will leave no stone un-turned in our vigilant effort to get you your compensation for your work injury. If you have been injured on the job in New York or Long Island and your workers compensation claim was denied, contact a GB&M lawyer today. We have an experienced NYC workers comp denial lawyer ready to help your case and get you the benefits you deserve. Don't wait a moment longer.